I have spent Saturdays plunging into green, frigid water. Though not what some visitors to the Men’s Pond in Highgate would call a regular, I’m there often enough to get used to, and love, the cold. This winter has been extra long, and extra cold. Here are a few pictures. January 1. 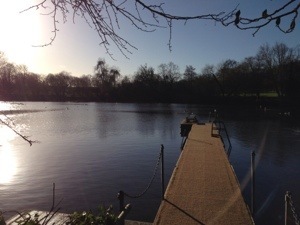 The waters of the Fleet that gather in these ponds offer renewal and hope for the year ahead. Note the presence of the sun in this picture: it has not been seen often. Not everyone wanted to bid farewell to winter. As February rolled into March signs of Spring were evident in slowly warming water. 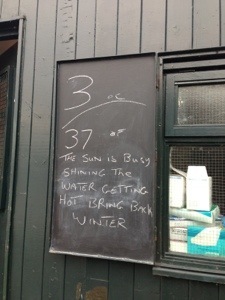 The lifeguard who wrote this sign got his wish: winter came back and temperatures cooled again. ‘There aren’t any women here, are they?’ John Cleese need not normally worry, the Men’s Pond is usually true to its name. 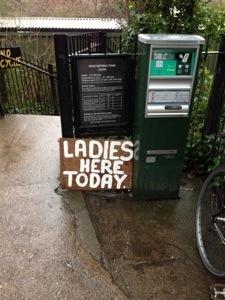 On this Saturday Ladies from the (where else) Ladies Pond were invited along. I envied their staying power in the water though to be honest some of them dilly-dallied about getting in. 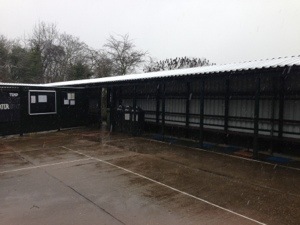 Anyone who’s been through the endless British winter of 2013 knows how snowy it has been. 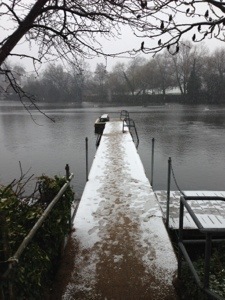 I should have known that at some point I’d have a snowy swim. This was the marvellous scene as I got changed, alone for once. Believe it or not the water was warmer than it ad been for some time. My sole concession to the cold water, neoprene gloves, kept my fingers warm but the snow numbed my feet as I walked along the jetty. What a wonderful winter. The pond is civilisation, tranquility and wide-eyed wonder at nature. For reasons I haven’t quite fathomed out, people who loved travelling to new places and exploring independently retreat into a shell of all-inclusive resorts and old school Mediterranean destinations when they have kids. Maybe they discover a new-found taste for seaside spots they would have avoided like the plague before, or maybe they just play it safe and have slightly less fun on holiday than they used to. Choosing Switzerland for our family holiday last year (2012) raised a few eyebrows among some of these people. Its appeal in winter was obvious. Black runs in Wengen, fondue parties, bottom-smacking games with the chalet hosts and all that. But go in summer? With kids? It was like unfurling a map with ‘here be dragons’ on it. And wouldn’t it be horribly expensive? We had arrived at the decision to go to Switzerland, though, through a process of elimination. It was June, and we didn’t want a long flight, so it should be Europe. Small boys like trains and their parents like swimming, which made us think first of Iceland, then Norway, then settle on the high Alps. We were aided by the discovery of this campsite, which convinced us we could sleep cheaply, in an idyllic location, and get around using public transport. After committing this far, as we planned so the delightful possibilities of the Berner Oberland revealed themselves. The next bit is in some ways the most complicated. A Swiss travel pass is an essential part of any visitor’s arsenal, conferring as it does not just a varying range of discounts on what non-Swiss would term public transport but also cutting the price of most cable-cars, funiculars and other unusual ways of getting up a mountainside. Not only that, but passes cut the cost of entry into many visitor attractions. In short, if you have one flash it everywhere. There are quite an array of passes out there. The Swiss Pass is the simplest and most flexible and also the most expensive. The Half Fare Card is cheaper and almost as useful if you’re not planning to ride trains every day but still want to do some roaming around. Note that while the Swiss Pass gets you most places it only offers a 25% discount beyond Kleine Schiedigg on the Jungfraujoch – the best way to get up there is to go either early or late in the day, or pick up the Jungfrau Pass. You need to get these passes before you go, so be organised. Full details at Swiss Travel System. Once in Switzerland, camping gives you a great excuse to economise. With views of the Jungfrau from just outside our tent we were more than happy to barbecue a few sausages or have simple meals as a family. Interlaken has three big supermarkets where you can stock up. Some things cost more than in the UK – meat was one of them – but basics were about the same and beer and ice cream, rather marvellously, were cheaper if you got them in a shop rather than a bar. Packed lunched helped too, and small boys with picky tastes were fuelled on several mountain yomps by endless cream cheese and cucumber wraps. They didn’t go a bundle on local cheese, but parents did, and a picnic next to a fast flowing stream, sitting in a flower-covered Alpine meadow seemed to make everyone happy. Other wonders were waiting. At the top of the Allmendhubel cable car, reached from Murren, was an idyllic kids playground. Another one was to be found at Bort, uphill from Grindelwald, bigger and better and – for the brave – with a Trottibike, a grown-up scooter you could ride with a child in front of you, to whizz down again on. We weren’t allowed to go on these with kids on the Niederhorn, by the way, but officials were happy for us to do so, with helmets provided, at Bort. I’m almost loathe to mention how deeply lovely the public swimming pool in Wengen is unless anyone else goes there. On an early summer morning we had it to ourselves. It has a perfect kids paddling pool, lawns to laze on and a high board to jump off, all to a backdrop of simply astonishing Alpine views. There was great swimming also to be found at riverside pools in Zurich and Thun and at Habkern near Interlaken and in Interlaken itself. In fact, just going from pool to pool could be a great holiday in itself. And that’s without even mentioning Lake Thun, clear and cool and always changing. Lastly, a few other points in Switzerland’s favour: it caters for kids, doesn’t charge the earth for them and has a very high standard of pretty much everything. If your children are under 16 they’ll travel for free, and discounts for those under 16 are universal. Those who feel their passion for the world’s great experiences should be enhanced, rather than diminished by having children would be wise to consider it. It is more than financially possible and will probably be one of the most memorable holidays you’ll ever have. 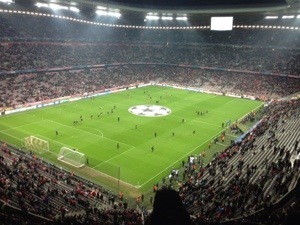 A European away trip is a rare pleasure, but when Arsenal drew Bayern Munich in the ’round of 16′ of the Champions League I was very keen to make it happen. Two reasons. First, I’d had a superb time here in 2003, when Arsenal lost 3-1 in the snow. 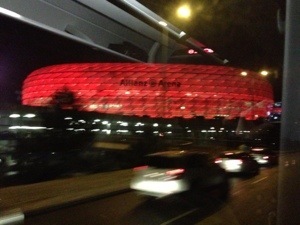 Second: it’s not every day that you get the chance to visit such a dramatic stadium as the Allianz Arena. Before the football, the railways. Most Gunners fans hit the pub upon arrival in the city, and stayed there all day. My Dad and I decided to do something else: a mad dash into the Alps to ascend Zugspitze, Germany’s highest peak. 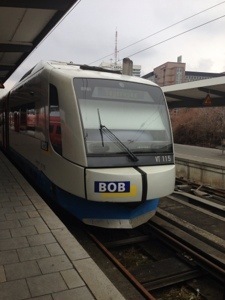 On arrival at Munchen Hauptbanhof we spotted Bob, part of the Bavarian mountain railway network. We took a lovely red chugger pulling over the Alps to Innsbruck for the 90 minute trip to Garmisch-Partenkirchen. Here we boarded the Bayerisches Zugspitzbahn, the sort of wonderful mountain train you find all over Switzerland and it was a joy to discover on a quick jaunt from Munich. 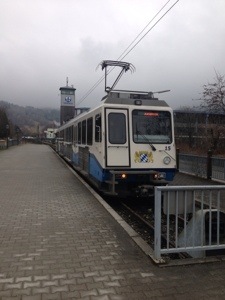 This train chugs up past ski schools and Alpine farmsteads until it reaches Eibsee, at which potent it plunges into the mountain and zig-zags up through the rock before emerging at the top of Germany. We we both lacking time to get to the 2588m summit and any guarantee of visibility once e got there, so de-trained here. 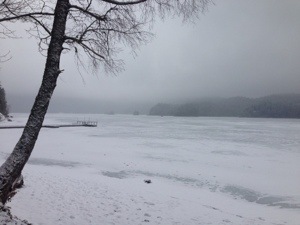 Five minutes away was Eibsee itself, frozen and still in the snowy silence. Time to throw a few rocks, enjoy an unusual Alpine outing then start the journey back to Munich. No mountain spectaculars but plenty of atmosphere and the ever-pleasant feeling of doing something silly. Back in Munich, we had time to have a quick beer a the Augustiner beer hall before catching the bus to the ground. Here history repeated itself. On my last visit I’d sat ate the only table not occupied by very jolly Arsenal supporters and been joined by two Bayern fans who were excellent company, speaking impeccable English and chewing the fat over the match to come. They also drank very large glasses of beer that made our pints look somewhat softie. Off to the ground, striking from outside and a bubbling cauldron of noise from within – until we scored at least. Pope Francis I was elected while we were in Munich. He nearly pulled off his first miracle in overturning an impossible deficit but it was not to be. After an exciting game, we headed back with sore throats and tired for the flight home, returning to a snowy Luton Airport. 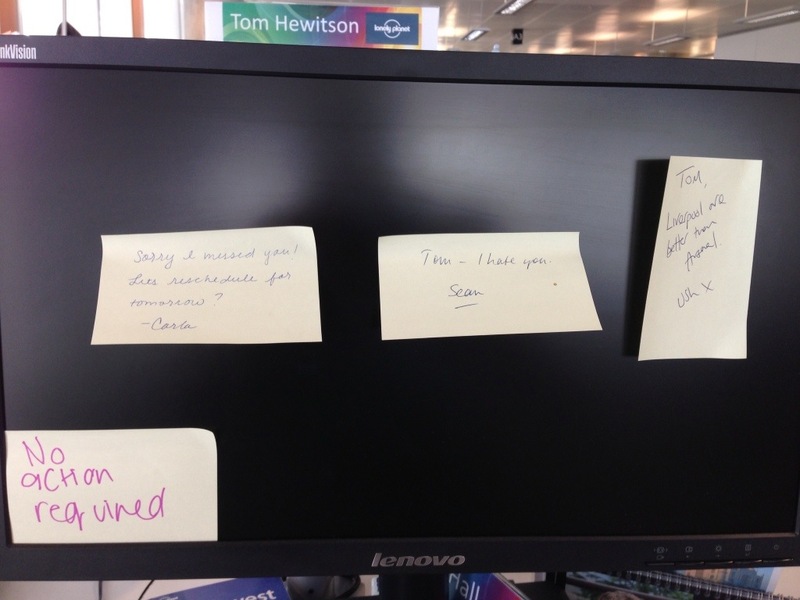 I returned to the following charming welcome at work the following day. Arsenal away: the years roll by but nothing stirs the soul in quite the same way.